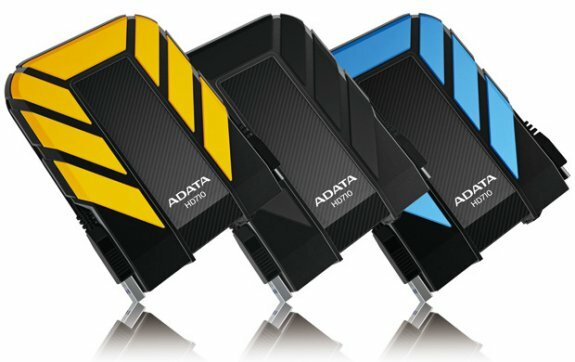 ADATA presents the DashDrive Durable HD710, a new line of external HDDs with USB 3.0 support. They measure 132mm x 99mm x 21.5mm and weigh 220g. ADATA™ Technology announces that the DashDrive™ Durable HD710 portable hard drive with an USB 3.0 interface is available in the US and Canada. The DashDrive family adds military-grade waterproof and shockproof (IPX7) protection to the company’s impressive lineup of external storage device. With the HD710 you no longer have to worry about accidental spills or drops destroying all your precious data. The housing of the HD710 is comprised of a unique silicone material making this external hard drive tough enough to handle life's daily abuses. The HD710 is capable of handling the toughest conditions while still delivering the blazing fast USB 3.0 transmission speeds consumers have come to expect. The USB cable tucks into a wraparound exterior slot in the drive casing so you don't have to fret about the cable hanging loose. The DashDrive™ Durable HD710 is now available in the US and Canada in capacities of 500GB, 750GB, and 1TB through selected distributors and resellers.